It’s the oldest form of political communication. Before there was Twitter or Facebook, before there were 30-second television ads, or super PACs, or even radio or newspapers — there was the stump speech. Ancient Greek politicians spoke directly to citizens in the Agora in Athens 2,500 years ago; 19th-century American politicians stood on tree stumps to deliver their direct pitches to voters. And today’s politicians are still at it. Day after day, sometimes several times a day, President Barack Obama and Mitt Romney make their case directly to voters. Most of what they say doesn’t make the news, because they’ve said it before, over and over, and reporters are seeking whatever is new. But voters should take a few minutes to pay attention. Each man is making his best case for why he deserves to be elected. Voters, however, should also beware. The claims candidates make don’t always square with the facts. In this article, part one of a two-part series, we examine examples of Obama’s factually exaggerated or misleading claims from two of his recent campaign speeches. We’ll go through Romney’s stump speech at a later time. Obama correctly states that manufacturing jobs have increased by more than half a million since hitting bottom, but he fails to mention that the number regained is less than half the total lost since he took office. He claims that “renewable” energy production has doubled on his watch, which isn’t true (only wind and solar have doubled). He claims he’d increase the tax rate on high-income earners to no more than they paid under Bill Clinton, when the truth is they’d pay more because of new taxes imposed to pay for the Affordable Care Act. He says “independent analysis” validates that his plan would cut $4 trillion from the deficit. But that total is inflated by $1 trillion in “savings” from winding down wars that he has promised to end anyway. He accuses Romney of proposing to raise taxes by $2,000 on middle-income taxpayers, when Romney has stated clearly that he wouldn’t do any such thing. He attacks Romney’s plan for Medicare as a “voucher” system that would leave seniors “at the mercy of insurance companies,” when the fact is, it’s structured the same as the system Obama’s health care law sets up for subsidizing private insurance for persons under age 65. There’s more — on automobile fuel efficiency, on imports and on exports. The president even complains of “all the cynicism that’s being fed to you through these negative ads,” as though his own campaign wasn’t spending 69 percent of its own millions on ads attacking Romney. Full quotes — and our dissections of the misleading claims in the president’s current stump speech — are contained in the Analysis section that follows. Note to readers: This is the first part of a two-part series examining the factual claims made by both major candidates. We will post our findings about Mitt Romney’s stump-speech claims in a subsequent Featured Article. With one exception, all the examples given here are from a campaign speech President Obama delivered in Las Vegas on Sept. 12. In addition, we’ve included another of his well-worn applause lines from a speech delivered Sept. 17 in Columbus, Ohio, as noted below. All are examples of points he has used before and, we have little doubt, will continue using as the campaign wears on. Obama, Sept. 12: After a decade of decline, this country has created over half a million new manufacturing jobs in the last two-and-a-half years. We reinvented a dying auto industry that’s back on top of the world. 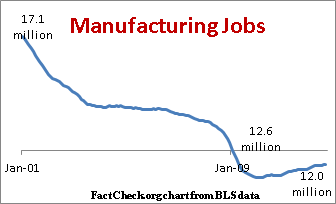 It’s true that manufacturing jobs declined during the Bush administration, and they have rebounded since hitting bottom one year after Obama took office. Since that low point, the economy has regained 512,000 of the manufacturing jobs lost since his inauguration in January 2009, according to August figures from the Bureau of Labor Statistics. But that’s still 582,000 short of where the total stood when Obama took office. At the current pace, it would take another three years to get back to even. Also, Obama is incorrect when he claims the U.S. auto industry is “back on top of the world.” As we pointed out when he used that line during his Democratic convention speech, the former world leader, General Motors, has slipped back to No. 2 in global auto sales and is headed for third place for the entire year, behind Toyota and Volkswagen. Obama: We can help big factories and small businesses double their exports. We can create a million new manufacturing jobs in the next four years. Obama first pledged to double exports during his 2010 State of the Union address, and he launched a National Export Initiative to help farmers and small businesses export more goods. But in the two-and-a-half years since then, exports of goods and services (see “Trade in Goods and Services, 1992 to present”) have increased just 28 percent. The most recent figures, released Sept. 11, showed a slight month-to-month decline for July. Even using 2010 as the start date, it will take years for exports to double at the current rate of increase. And the promise of adding “a million new manufacturing jobs in the next four years” would require a faster rate than we’ve seen so far. It would take five years — not four — for the economy to add 1 million more manufacturing jobs at the average monthly pace since the number of those jobs hit bottom. Fuel Standards ‘Save You Money’? Obama: After 30 years of inaction, we raised fuel standards so that by the middle of the next decade, your cars and trucks will go twice as far on a gallon of gas. (Applause.) That will save you money. It’s true that the administration is pushing forward with a “final rulemaking” that would require model year 2025 autos and light trucks to achieve the equivalent of 54 miles per gallon. That’s actually well short of double the current 29.7 combined average, which is required for the 2012 model year under rules that took effect in 2010. It’s also debatable how much money this ambitious regulation will save consumers over the long run. In the short run, it will certainly require new car buyers to pay higher prices. By the government’s own estimate, higher costs for new vehicle technology to meet the standards “are projected to add, on average, about $1,800 for consumers who buy a new vehicle” in model year 2025. That’s compared with the estimated cost of a 2016 vehicle, which in turn will cost $492 more than a 2012 vehicle to meet the rising standards mandated in 2010, under the official estimates given at the time (Table I.C.1–10, page 25346). That’s a total of about $2,300 more than today’s vehicles — plus any sales tax on the added purchase price. To be sure, the government estimates that fuel savings will eventually offset the higher purchase price — but that will take years. “[F]uel savings will offset the higher vehicle cost in less than 3.5 years,” according to a “fact sheet” by the Environmental Protection Agency. The official estimate is that fuel savings will produce “a net lifetime savings of $3,400 to $5,000” for the 2025 vehicle. But that assumes that the cost of gasoline at the pump will average $3.87 per gallon (in 2010 dollars), which is based on the most recent “reference case” projection by the U.S. Energy Information Administration. That projection could turn out to be high, or low. Such projections are notoriously volatile and uncertain. Under EIA’s “high oil price” scenario, gasoline would average $5.20 in 2025, and the payback period would be faster and lifetime savings would be greater. But under EIA’s “low oil price” scenario, gasoline would fall to $2.19, and it would take longer for fuel savings to offset the added cost. Obama: We have doubled the amount of renewable energy we generate, including right here in Nevada — solar panels all across this state. It’s simply not correct that “renewable” energy as a whole has doubled. Obama is referring only to the relatively small portion accounted for by wind and solar generation, which has indeed doubled. As we’ve noted previously, when the much larger contributions of biomass (such as ethanol) and hydropower are included, the overall category of “renewable” energy produced is up by about 27 percent (see Table 1.1) from 2009 to 2011, according to the most recent figures available. And all renewable energy combined still accounted for only about 9 percent of the nation’s energy production in 2011. Obama: Today, the United States of America is less dependent on foreign oil than at any time in nearly two decades. What the president says is accurate, but he can’t claim exclusive credit. The trend of decreasing dependence on foreign oil began after peaking in 2005, when Obama was a freshman U.S. senator from Illinois. And the trend results from bigger forces than increased wind and solar, or federal mileage standards. The EIA states that the trend is the result of a variety of factors including the economic downturn (curbing consumption) and new drilling technology (increasing domestic supply). EIA, July 13: The economic downturn after the financial crisis of 2008, improvements in efficiency, changes in consumer behavior and patterns of economic growth, all contributed to the decline in petroleum consumption. At the same time, increased use of domestic biofuels (ethanol and biodiesel), and strong gains in domestic production of crude oil and natural gas plant liquids expanded domestic supplies and reduced the need for imports. Cutting Deficit by $4 Trillion? Obama: Independent analysis shows my plan for reducing the deficit would cut it by $4 trillion. And even taking Obama’s $4 trillion claim at face value and using projections of his own Office of Management and Budget, the projected annual federal deficits would never be lower than $476 billion, which is higher than any year of the Bush administration except for the $1.4 trillion shortfall for fiscal 2009, for which Obama himself bears some responsibility. And under Obama’s plan, deficits would be rising for the last three years of the 10-year period, reaching $565 billion in 2021 (see table S-1). This is one of Obama’s favorite points, but it’s not accurate. Tax rates on family income over $250,000 (and on income by single taxpayers exceeding $200,000) will be higher than they were when Clinton was president. It’s true that the top federal income-tax rate would be allowed to rise from the current 35 percent to 39.6 percent, which was the rate that prevailed after Clinton’s 1993 tax increase, and before Bush’s tax cuts. The next-highest rate would go back to the Clinton-era 36 percent, starting with family income over $250,000 (or $200,000 for singles), up from the Bush rate of 33 percent. But Obama fails to note that his Affordable Care Act loads additional taxes on those same upper-income taxpayers. Taking effect Jan. 1 is a new 3.8 percent tax on “unearned” net investment income — such as capital gains from the sale of stocks or real estate, dividends, interest income, annuities, rents and royalties. Also starting Jan. 1 is a new 0.9 percent Medicare surcharge on top of the current Medicare payroll tax. It also applies to taxable compensation that exceeds $200,000 for singles, or $250,000 for couples filing jointly. Together these two new taxes will bring in nearly $209 billion over the next seven fiscal years, as estimated by the nonpartisan Joint Committee on Taxation. Obama: And by the way, I will never turn Medicare into a voucher because no American should have to spend their golden years at the mercy of insurance companies. Technically, Romney and running mate Paul Ryan are not proposing a “voucher” system for Medicare. Their plan would operate pretty much the same way that new health insurance exchanges will work for those getting subsidized coverage under Obama’s own Affordable Care Act. It’s also the way the Federal Employee Health Benefits system has worked for decades, covering over 9 million civilian federal workers, retirees and their families. That is, the government will pay a portion of the premiums for private insurance coverage chosen by the beneficiaries, and pay it directly without resorting to issuing vouchers. It is also the way the current Medicare Advantage program works, covering nearly 12 million seniors who choose private plans over traditional, government-run Medicare coverage. It’s even the way Medicare’s prescription drug benefit works. No vouchers involved. And it’s far from clear that the Republican approach could achieve the level of cost reduction it predicts without also cutting benefits or increasing out-of-pocket expenses for seniors. It’s not even clear how many would choose private coverage, since Romney and Ryan would include traditional Medicare as a choice under their plan. But claiming that it’s a “voucher” system that would put seniors “at the mercy of insurance companies” is misleading. It ignores the plain fact that Obama supports other, popular health-care programs that work the same way. A point he didn’t bring up in his Sept. 12 speech — but has repeated many times in his other stump speeches — came up again a few days later at another campaign appearance, in Columbus, Ohio. Obama, Sept. 17: I am not going to ask middle-class families with kids to pay over $2,000 more so that millionaires and billionaires get to pay less. Obama’s $2,000 figure comes from an analysis by the Tax Policy Center of “a revenue-neutral individual income tax change that incorporates the features Governor Romney has proposed.” Romney has not provided details on what tax credits and deductions would be eliminated. The TPC calculated whose tax breaks would need to go — starting at the top — to make up for the revenue that would be lost by cutting rates 20 percent for everybody, as Romney has promised. And it concluded that “taxpayers with children who make less than $200,000 would pay, on average, $2,000 more in taxes” if Romney cut rates as promised without losing revenue. But this does not prove that Romney will increase taxes on those making under $200,000. It’s just evidence that Romney can’t deliver everything he has promised. Romney could cut rates less, or let the federal deficit rise more, and still not raise taxes on those making under $200,000. Or he could define the “middle” to be taxpayers much lower down on the income scale. Obama: If you buy into all the cynicism that’s being fed to you through these negative ads, well, you know what, change won’t happen if you stop fighting for it. The fact is Obama’s campaign has been feeding the cynicism, too. The president’s campaign had spent $147 million on TV spots through Sept. 9, of which 69 percent were negative, according to the Washington Post’s “Mad Money” website, which tracks such spending on a weekly basis. In addition, 100 percent of the $22.6 million spent by the Democratic National Committee on Obama’s behalf also went for ads rated as negative. And 96 percent of the $9.8 million spent by the pro-Obama group Priorities USA has also been rated negative. To be sure, Romney and his GOP allies also have spent tens of millions running ads attacking Obama, other Democrats and even Romney’s Republican primary foes. But the president can’t pretend that negative ads or political cynicism is their fault alone. Correction, Sept. 25: We originally gave the date of the president’s Las Vegas speech incorrectly as Sept. 13. It was Sept. 12, and a transcript appeared on the White House website the following day. Obama, Barack. “Remarks by the President at a Campaign Event — Las Vegas, NV.” The White House. 13 Sep 2012. Obama, Barack. “Remarks by the President at a Campaign Event — Columbus, Ohio.” The White House. 17 Sep 2012. U.S. Bureau of Labor Statistics, Current Employment Statistics survey (National). “Manufacturing, Seasonally Adjusted, All Employees.” Data extracted. 17 Sep 2012. Robertson, Lori et al. “FactChecking Obama and Biden.” 7 Sep 2011. Lienert, Paul. “Toyota regains top global auto sales spot, with VW in pursuit.” Reuters. 26 Jul 2012. Obama, Barack. “Remarks by the President in State of the Union Address.” The White House. 27 Jan 2012. The White House. “President Obama Provides Progress Report on National Export Initiative, Announces Members of the President’s Export Council.” 7 Jul 2010. Bureau of Economic Analysis. “U.S. International Trade in Goods and Services, July 2012.” 11 Sep 2012. Bureau of Economic Analysis. “Trade in Goods and Services, 1992-present.” 11 Sep 2012. U.S. Environmental Protection Agency. “EPA and NHTSA Set Standards to Reduce Greenhouse Gases and Improve Fuel Economy for Model Years 2017-2025 Cars and Light Trucks.” Aug 2012. U.S. Environmental Protection Agency & U.S. National Highway Traffic Safety Administration. “Light-Duty Vehicle Greenhouse Gas Emission Standards and Corporate Average Fuel Economy Standards; Final Rule.” Federal Register. 7 May 2010. U.S. Energy Information Administration. “Table 1.1.A. Net Generation by Other Renewables: Total (All Sectors), 2002-June 2012” 24 Aug 2012. Robertson, Lori. “Renewable Energy ‘Doubled’?” FactCheck.org. 14 Sep 2012. U.S. Energy Information Administration. 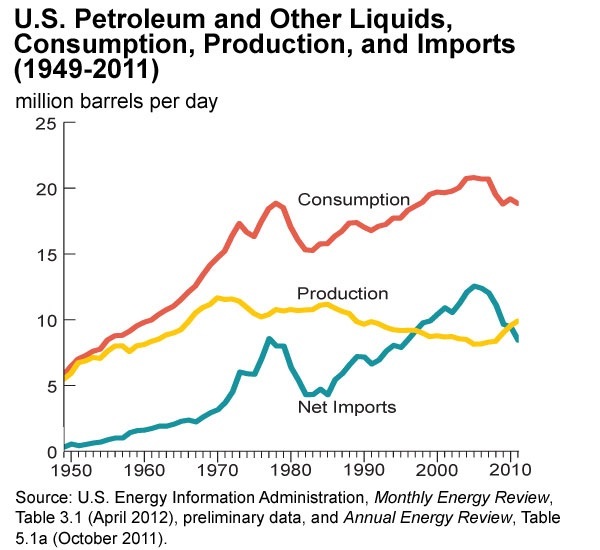 “How dependent are we on foreign oil?” 13 Jul 2012. The White House; Office of Management and Budget. “Living Within Our Means and Investing in the Future; The President’s Plan for Economic Growth and Deficit Reduction.” Sept 2011. Committee for a Responsible Federal Budget. “CRFB Reacts to the President’s FY 2013 Budget” 13 Feb 2012. Jackson, Brooks. “Obama’s Spending; ‘Inferno’ or Not?” FactCheck.org. 4 Jun 2012. Fava, Karl L. and Kenneth L. Rubin. “Planning for the New 3.8% Medicare Tax on Unearned Income.” American Institute of CPAs. 1 Jul 2011. Internal Revenue Service. “Questions and Answers for the Additional Medicare Tax.” 4 Aug 2012. U.S. Congress, Joint Committee on Taxation. “Estimated Revenue Effects Of The Amendment In The Nature Of A Substitute To H.R. 4872, The “Reconciliation Act Of 2010,” As Amended, In Combination With The Revenue Effects Of H.R. 3590, The “Patient Protection And Affordable Care Act (‘PPACA’),” As Passed By The Senate, And Scheduled For Consideration By The House Committee On Rules On March 20, 2010.” 20 Mar 2010. U.S. Department of Health and Human Services, Healthcare.go website. “Affordable Insurance Exchanges.” Accessed 18 Sep 2012. U.S. Office of Personnel Management. “Insurance Benefits.” Web page accessed 18 Sep 2012. Kaiser Family Foundation. “Medicare Advantage” fact sheet. Nov 2011. Romney, Mitt. “Remarks to the Republican National Convention.” 30 Aug 2012. Brown, Samuel and William G. Gale and Adam Looney. “On the Distributional Effects of Base-Broadening Income Tax Reform.” Tax Policy Center. 1 Aug 2012. Marron, Donald. “Understanding TPC’s Analysis of Governor Romney’s Tax Plan.” Tax Policy Center. 8 Aug 2012. Next StoryBrown ‘Lying’ About Abortion Stance?